I hope you enjoy looking at them - click image for larger view! 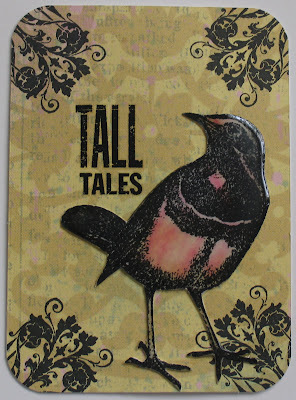 TALL TALES measures approx: 3" x 4"
*edit: the bird on this piece is done in a dimensional adhesive...my new favorite product! It looks like the image is embedded in glass...loooove it! 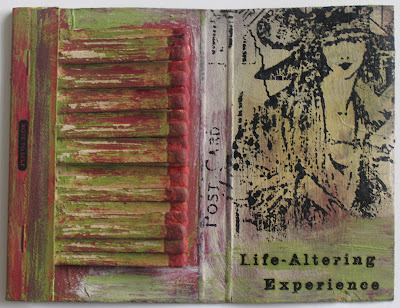 Note To Self: Life Altering Experience measures approx: 3" x 3 7/8"
And by the way, I am starting to think of you and Jill as my family in the southland. You know, seeing as Jill and I are leading twin lives and all. But if that were really the case, then you would choose to live outside of the US, like my mom, and spend a lot of time hanging out with artists and musicians. Tammy, as par for the course YOU are ALWAYS so supportive and so kind! THANK YOU! You are a new face here - welcome!